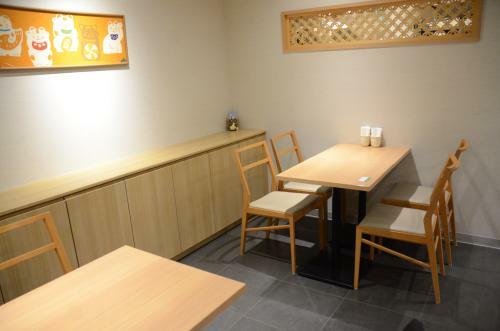 Kamakura Hase Shiori-an is a soba restaurant situated just 7 minutes on foot from Hase Station on the Enoden Line. It is one of the rare soba places that offers vegan and vegetarian options with their shojin (Zen Buddhist vegetarian cuisine) broth. The noodles are juwari-soba (soba noodles made from 100% buckwheat flour). 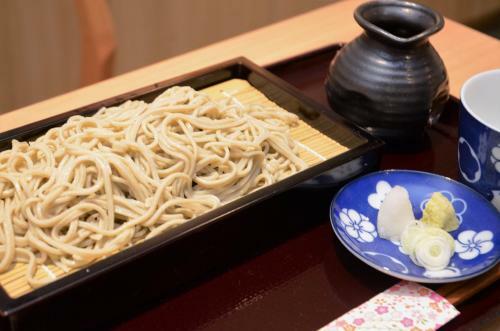 The simple and savory soba can be enjoyed by eating and also by hands-on soba-making! Curious to know more about the lucky and auspicious soba that always holds together no matter who makes them? The Vegewel team went and actually experienced the soba making! While we were there, we had the opportunity to indulge in deep conversation with the owner, Tomohiro Onda, as we satisfied our palates with some soba. Click here for location and detailed information on Kamakura Hase Shiori-an. 1 The auspicious soba restaurant that “always holds together”! 2 Amazing juwari-soba served with shojin broth – vegan menus that can only be enjoyed at a soba restaurant. 3 There’s more to soba than just eating it. Get even luckier with the soba making experience. What is this owner’s “twin dragon style” technique for making soba? The auspicious soba restaurant that “always holds together”! Shiori-an can be reached by walking along the main street of Hase in the direction of the Kotoku-in Temple where the Big Buddha of Kamakura is enshrined. The restaurant is situated on the second floor, but there is a sign out along the street so it should be easy to find. The interior is simple and clean. Before Shiori-an opened, the location used to house a shaved ice shop. Shiori-an is famous for it being a soba restaurant of “connectedness”, but how did that come about? “Shiori-an’s soba is a simple juwari-soba. It is made from 100% buckwheat flour. Normally, juwari-soba is considered a challenge to keep together because it contains no binder materials. The secret to this was revealed when we tried our hand at soba making. Amazing juwari-soba served with shojin broth – vegan menus that can only be enjoyed at a soba restaurant. Shiori-an serves their soba with an option of tuna broth or the shojin broth which is made with Hidaka konbu (kelp produced in Hidaka) and domestic shiitake mushrooms. Vegetarians and vegans can enjoy a delicious soba at any time. 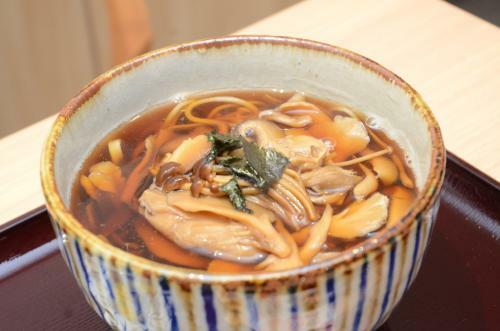 Pictured is the Shojin Kinoko (mushroom) Soba (1,200 yen with tax). The dish is loaded with mushrooms! The hot soba will keep your body warm to the core. It is a seasonal menu so do try it during the colder months. Above is the Shojin Seiro Soba (chilled soba served on a bamboo mat) (900 yen with tax). The seiro soba can also be enjoyed with shojin broth! This broth is full of umami and flavor, and just as satisfying as the tuna broth. Those who are okay with tuna broth can order both broths to compare the two tastes with an additional 100 yen. You can also get your drink on at this soba restaurant. 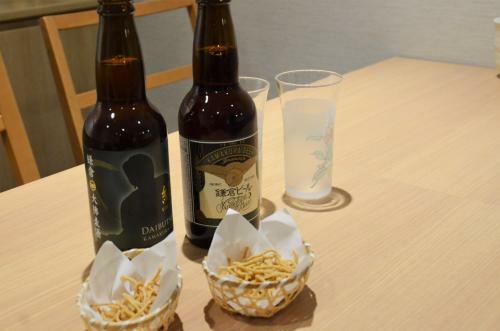 At the time of the interview, we had the local beer, Kamakura Beer (700 yen with tax), and the craft beer, Daibutsu Mugi-shu (Big Buddha Beer) YUKARI (700 yen with tax), the perfect choice befitting the location. The fried soba on the side was a nice touch. 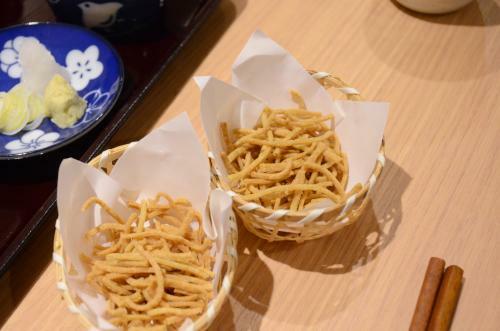 The leftover bits from the soba dough were used to make these fried soba. The flavor of the juwari-soba remained, but the texture was nice and crunchy and very addictive! 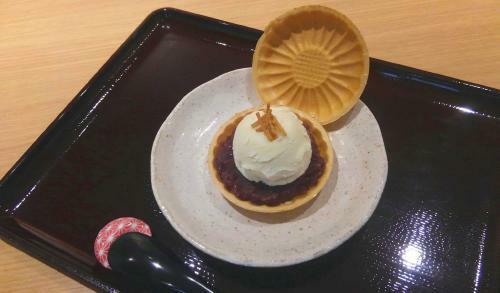 Organic Vanilla Ice Cream Monaka (monaka is a Japanese dessert made with sweet azuki bean paste and sandwiched with crisp mochi wafers) (400 yen with tax). The vanilla ice cream is a soymilk base and vegan. Topped with the fried soba, it’s a pleasure to be able to enjoy these different combinations of soba in the vegan style! We asked why they chose to incorporate a shojin menu. 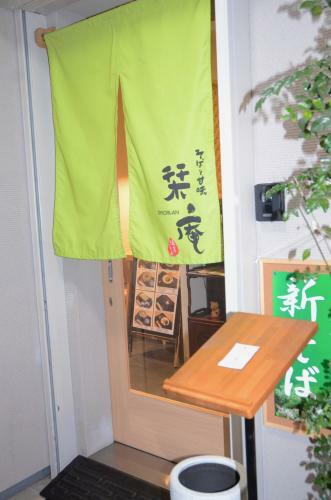 ”When I was learning to make soba, there were many times that vegetarian customers visited the soba restaurant. When I spoke with them, I was told that vegetarians can eat the soba, but in most cases, they aren’t able to eat the broth, so they carry around their own vegetarian broth. So that got me thinking that vegetarians would be able to enjoy the soba if we prepared the broth on our end. There’s more to soba than just eating it. 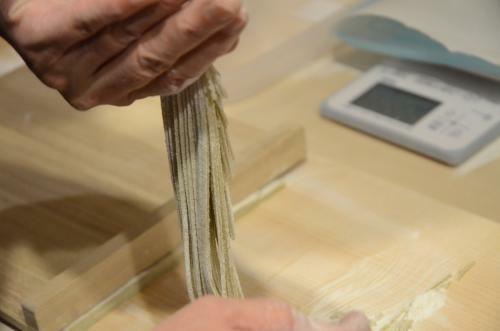 Get even luckier with the soba making experience. What is this owner’s “twin dragon style” technique for making soba? The shojin soba dishes that were mentioned earlier were actually prepared with the soba that the Vegewel team made at the soba making workshop! At Shiori-an, you can experience making the soba and also have your soba prepared into a dish of your choice. We will now give you the details of the soba making workshop. 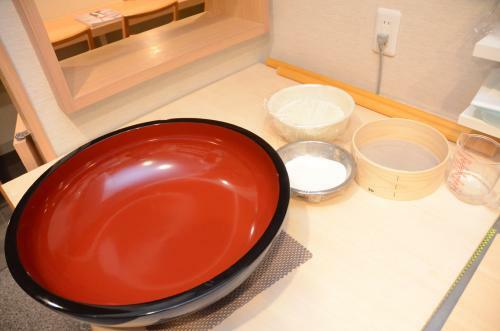 You will have the opportunity to step foot into the same kitchen that Mr. Onda usually makes the soba, to make your own. The workshop is available to a maximum of 4 participants. Two of our Vegewel team went to experience it this time around. 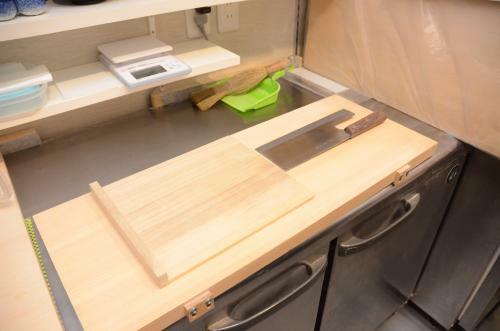 The soba chopping board and soba knife. The first step is sifting the buckwheat powder. Then, equal parts of cold water and hot water are incorporated with a motion resembling a drawing of a dragon. Mr. Onda has named this one-of-a-kind method of Shiori-an’s soba making as the “ twin dragon style”. ”It is extremely difficult for novice soba makers to make juwari-soba without them falling apart into pieces. 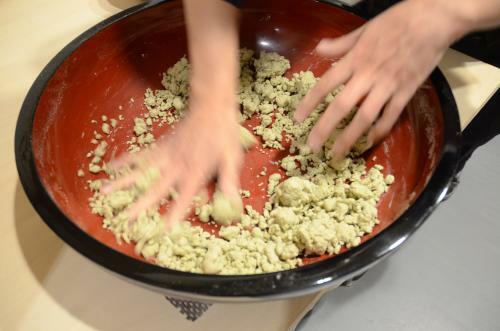 Using all 5 of your fingers and mixing in a big and round motion, the buckwheat powder begins to come together. With Mr. Onda’s instructions, the soba dough is complete. 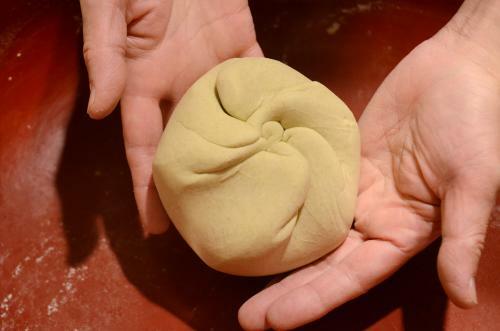 Once the dough has come together, it is time for the next step of rolling them out evenly. 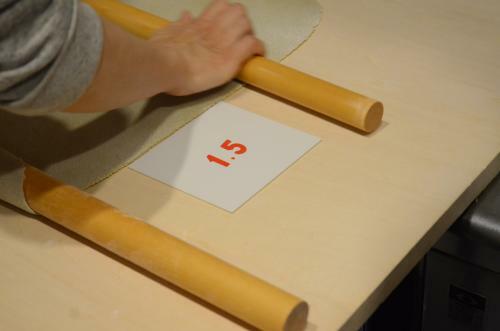 Rolling pins are used, but it is a challenge to maintain the evenness! After watching multiple times and following Mr. Onda’s fine example, we were finally able to complete the rolling process. 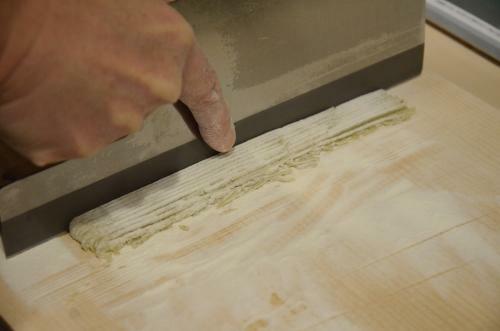 The goal is to roll out the dough to a thickness, or thinness rather, of 1.5mm. It was a good reminder that handmade soba requires a lot of effort, even though we tend to forget and not think much of it when we normally eat the noodles. We have much to be thankful for. Ladies and gentlemen, we are now entering the highlight of the soba making workshop. 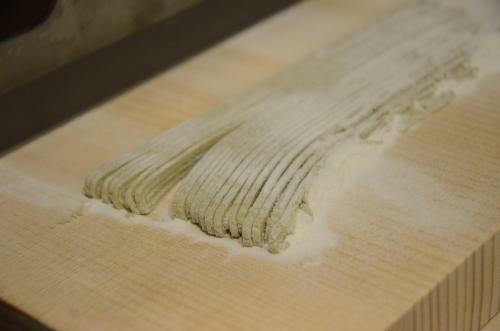 The next step is cutting the soba. The repetitive cutting process becomes meditative. The time passes as you concentrate fully on the soba in front of you and it makes you forget about the everyday things. The soba were cut pretty well for the first try, no? The 2 Vegewel staff were proud of the accomplishment. The rest is left up to Mr. Onda who will prepare the finished soba into the dishes of our choice. 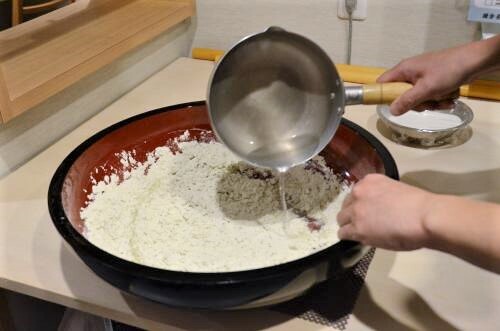 At the soba making workshop, 500g of buckwheat flour (approximate yield for 5) are used at one time. There were only two of us, so we had more than enough of our share to take back home with us. ”Because our soba always keeps together, we’ve had a match-making website feature our store. How about making some soba for good luck?” says Mr. Onda. 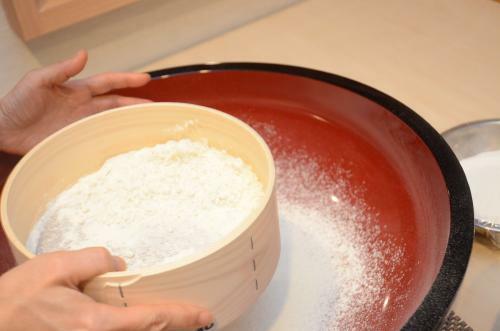 It’s a rare opportunity to try your hand at making juwari-soba. What’s more, it is a very auspicious occasion where you can always make the soba hold together without fail. The soba making experience is great to be enjoyed with friends, by couples, or by yourself. Mr. Onda’s informative and gentle instructions on the art of soba making are highly recommended!